Kendra Deja LCSW, MSN, GNP-BC, ACHPN has joined the CSU Institute for Palliative Care as our Manager of Clinical Curriculum. Kendra has worked her entire career in hospice and palliative care, first as an LCSW, and then as a nurse and nurse practitioner. Kendra has worked in community hospice, completed a VA palliative care fellowship, and has been part of both inpatient and outpatient palliative care teams in an acute care setting. We are delighted to have her join our team and look forward to her applying her transdisciplinary skills and clinical experience to working with our faculty and developers, as well as to being part of setting our future development directions. 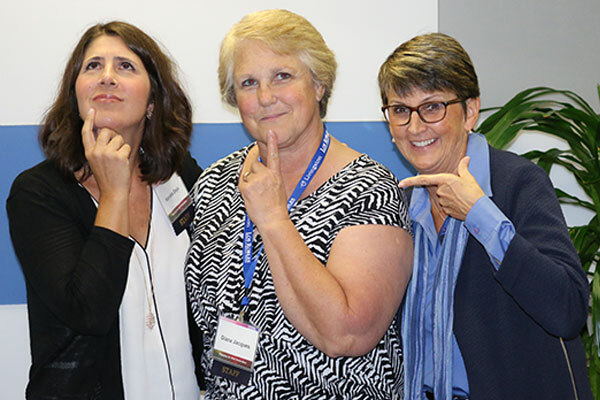 Kendra Deja (left) hamming it up at the Institute’s 2016 Symposium with Institute faculty, Diana Jacques (center) and Director, Education Operations, Eileen Piersa (right). As a nurse practitioner, Kendra has worked in a variety of settings that bring depth to her experience. She has worked in community hospice, in long-term care and long-term geropsych facilities at the Palo Alto VA Healthcare System, and most recently worked at UCSD Medical Center on an inpatient palliative care consult service, and an outpatient palliative care clinic embedded within a cancer center. Kendra has been working with the CSU Institute for Palliative Care as a faculty member on the Advance Practice Registered Nurse Certificate in Palliative Care course for the last two years. Her demonstrated skills and experience, led to joining the Institute in her new role while maintaining her involvement with the teaching the APRN course. 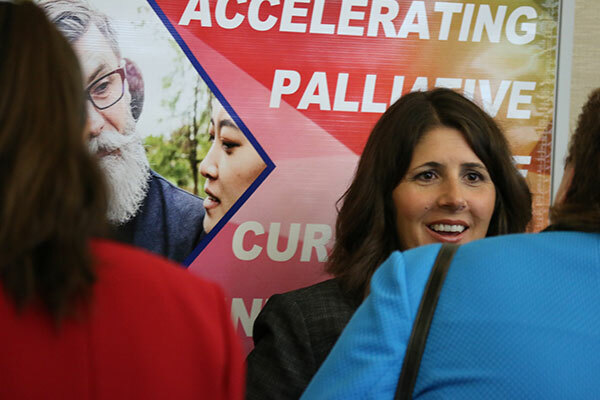 Kendra states that her goal was always to work in hospice and palliative care because it allows her to connect to people on the most human level. Her first career exposure to helping those with serious, chronic illness was as a certified nursing assistant in a memory care unit during college. She received her baccalaureate degree in psychology and social welfare from the University of Wisconsin-Madison, and then went on to complete her Master of Science in Social Work (MSSW) from UW-Madison with older adult and mental health concentrations. After graduating with her MSSW, she went on to work part-time as an inpatient psychiatric social worker at the Madison VA Medical Center, and part-time as a bereavement counselor for a local community hospice agency. Kendra in action at our 2016 academic symposium. These two professional roles helped Kendra develop a passion for caring for both veterans and the dying. When the VA began its Interprofessional Fellowship in Palliative Care Program in 2002, Kendra jumped at the chance to participate in the social work fellowship at the Los Angeles VA and combine these two passions into a career of caring for dying veterans. At the completion of the VA Palliative Care Fellowship, Kendra worked at the San Diego VA Medical Center as a social worker for critically ill inpatient and outpatient veterans, and acted as the chair of the Palliative Care Consult Service and Palliative Care Resource Team. Working with other professionals on the palliative care team inspired her to enroll in nursing school and ultimately become a nurse practitioner, specializing in geriatrics and palliative care. Her passion for expanding care for people at the most human level continues on, underpinning her work now as Manager of Clinical Curriculum role at the Institute.